It should be noted that Tom was awarded the coveted C.I.B. (Combat Infantry Badge), two Bronze Stars and a Silver Star for valor. Tom Allison's war experience was what led him — albeit indirectly — to head the town of Carroll highway department. After his return from Vietnam in 1970, Tom started working in the family business, Shotcrete Construction. “I operated it from then on because my dad was of ill health. We poured foundation walls, floors, patios. We'd set the forms and then hire a pump. I took over the business from my mother in 1987 after my father died. I operated it until 1995, at which time I sold it to another local company. I worked for them for five years before my contract ended in May 2000. Tim Eklund runs a Maxigrind 460G to grind up brush. “The town needed a little help. It was stagnant as far as the highways were going. They were being maintained, but the town wasn't growing or improving. I wanted to work for the town and make it a nicer place to live. I believe I have. Tom married his first wife in 1970. “We had two children, Chad, 47, a salesman for a local concrete company and Kate, 43, assistant town clerk for the town of Ellington and secretary for the Lenea Foundation. I married my current wife, Sharon, in 1988. She owns a dog boarding and grooming business, Dog Moms Boarding and Grooming. She has three sons: Mike, 43, a sprinkler fitter; Matt, 41, did four years in the Air Force and now is a FedEx courier; and Scott, 40, works for Nestle Purina, where he manages the dog food operations in Dunkirk, N.Y. Between the five kids, we have 15 grandchildren and two great-grandchildren. 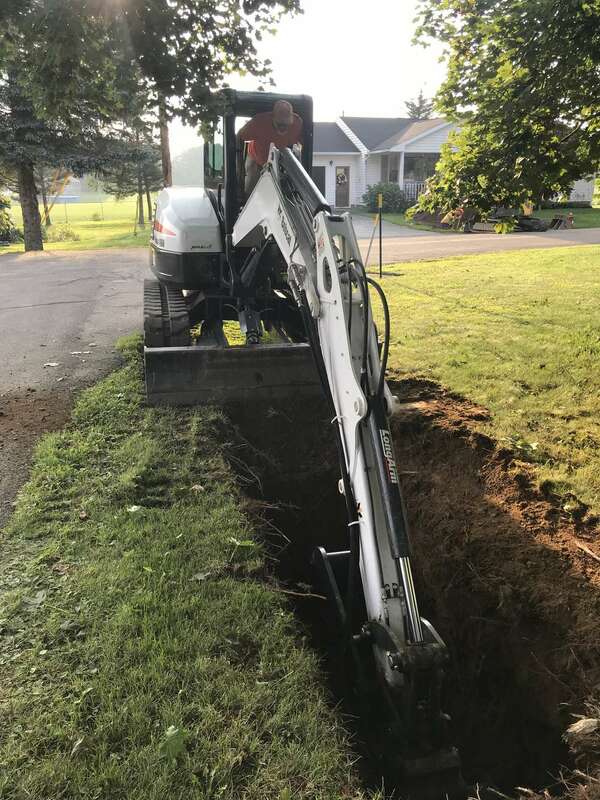 Mike Walker digs a water main ditch using a Bobcat E55 mini-excavator. Tom and his crew also built a 30-ft. x 72-ft. pole building in 2010. It holds all the department's plows, wings and sanders, the summer pickup trucks, a Woodchuck chipper and sidewalk tools and forms. Finally, the department has a 60-ft. x 60-ft. salt/sand shed (600 tons). It also has a 24-ft. x 24-ft. shed (160 tons) just for pure salt. “We use a 3 to 1 mix for our sand and about 1,500 tons of salt. We use straight salt in the village so there's no sand to clean up. The job of superintendent calls for Tom to maintain the town's 106 lane miles. That includes 98 town roads and eight county lane miles of road. Forty-eight of those miles are paved and one is gravel. That translates into six plowing routes that take roughly 2.25 hours to complete. 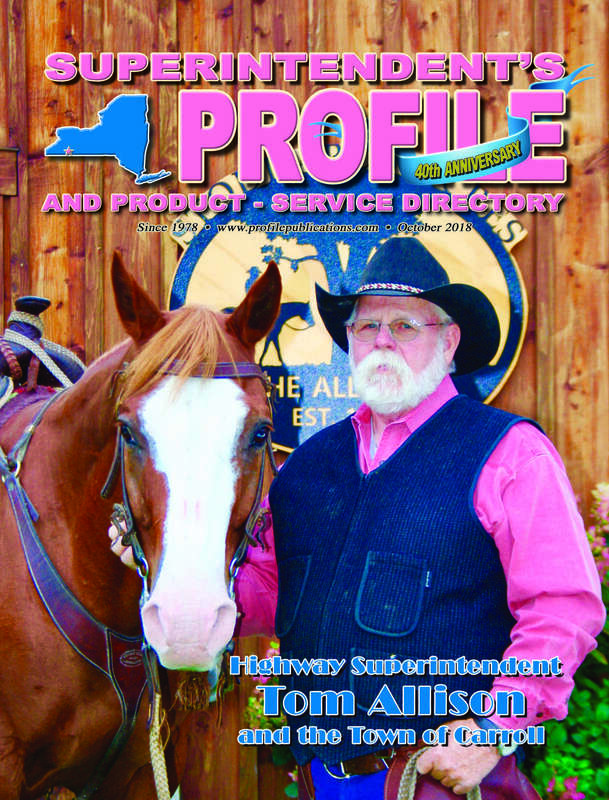 Tom depends on his crew of five full-time employees to serve the town's 3,500 residents. His staff includes Deputy Superintendent Mike Walker, MEOs Doug Sandberg, Tim Eklund, Jeremy Klice and Matt Powers. They also have two part-timers, Wayne Lindstrom (who's retiring this year) and Melissa Hultberg. The youngest is 26 and the oldest is 74. 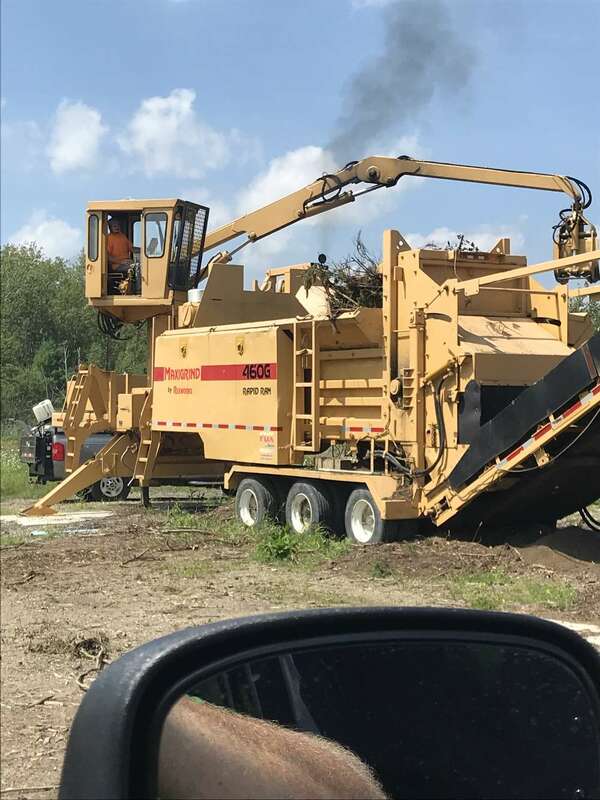 Under Tom's attentive eye, the town of Carroll's highway department functions on a total operating budget of $1,060,596 that includes salaries and benefits for employees and an annual CHIPS allocation of $113,498. The department also receives $25,907 from PAVE-NY and $21,750 from Extreme Winter Recovery. Like his counterparts, Tom agrees that today's equipment has its pros and cons. Tom's best day on the job was when the department held an open house for their new digs in October 2011. What frustrates this highway superintendent? When asked what's disappointed him the most, Tom is quick to reply. “The two-percent tax cap. It was implemented by the governor and every town must deal with it. They can pass a resolution to go above the tax cap or stay below. What's disappointing about it is everything we have here has increased in price by more than two percent. Last year, it was less than that. If you can only have a two-percent tax cap in your budget, most of that's eaten up by your employee benefits. That leaves trying to get the same amount of services done with a lot less money. That ain't working. It's not feasible to go below the cap. It's extremely hard to handle that with my budget. We got a new supervisor this year and the town board passed a resolution to go above the tax cap if necessary. Hopefully, I can keep my budget within reason without going above the cap, but I can't see me staying at two percent. Looking ahead, Tom has several projects on the horizon. “We're going to take out and put in a box culvert. We have an engineering firm helping us with that. We're trying to get a grant through the Bridge NY. It just became available here in April. It's for rural roads and bridges that qualify. If you meet the criteria and there's any money left, you'll get a piece of it. The estimated cost is $120,000. “I'd also like to finish paving some roads I've started that are longer than most. This year was our most ambitious paving job. We paved 2.5 miles of the high traffic, 5-mile Oak Hill Road. All our monies went into that. I hope to pave the other end of it next year. It hasn't been touched with pavement since I've been here. Tom also is a big proponent of shared services. “We recommend doing that when at all possible. If any county in the state calls, I'll help them if I can and they'll help me. Typically, we work with the two or three towns that are right around us. Those are the towns we own the equipment with. When it comes time to retire, how would Tom like to be remembered? The town of Carroll, in the extreme southeastern part of the county, was erected in 1825 from the town of Ellicott, and named in honor of Charles Carroll, of Carrollton, the immortal Signer, who in affixing his name to the Declaration of Independence added his residence, that there might be no doubt of his identity if misfortune overtook the cause for which he was risking his life and fortune. The town, broken and hilly in the northeast and east parts and rolling in the south and southwest, originally included the present town of Kiantone, which was set off from Carroll in 1853. Conewango Creek forms the greater part of the boundary line between the two towns, entering Carroll from the north and continuing to the Pennsylvania line. The town contains 20,658 acres, the highest summits, being 1,400 ft. above tidewater. Frewsburg, on the Dunkirk, Allegheny Valley & Pittsburgh railroad, is a thriving village with important industrial establishments — The Carroll Furniture Company, the Frewsburg Canning Company, and the Merrell-Soule Company, dairy products. There are in Frewsburg four small factories. Other villages of the town are Fentonville in the south, Dodge in the east, and Ivory in the north. The population of Carroll, according to the State census of that year, was 1,714, of whom seven only were aliens. The first settlers were John Frew on lot 61, and Thomas Russell on west half of lot 53 at the mouth of Frew Run. In the spring of 1809 John Frew paid $2.25 an acre, built a log cabin, and put in crops in 1810. A few months later, George W. Fenton sold his farm on Chadakoin River and located on lot 52, south of and adjoining the lands of Frew and Russell. Frew and Russell built a saw mill in 1810, and commenced sawing the next spring. They ran the sawed boards to Pittsburgh. James Frew was connected with them in building the mill, and purchased Russell's interest in 1814. In 1817, with their father, Hugh Frew, they built an “overshot” gristmill, using the gearing and stones of their father's old mill in Pennsylvania. George W. Fenton developed a large farm, and opened the first store in Frewsburg. John Tyler was on lot 51 by June, 1808; his son Hamilton, born 1810, was the first white child born in the present town. Isaac Walton was on lot 41 and Charles Boyles on lot in the summer of 1809. Lumber is such an important factor in Carroll's progress and development that the following article on “Carroll-Early Lumbering,” from the pen of Mrs. Effie W. Parker, in “The Centennial History of Chautauqua County,” published in 1904, is largely drawn upon. It has been stated by historians that “no more magnificent forest existed in the United States than that which cast its mighty shadows over primitive Carroll” — a forest not only vast in extent, but the trees were larger than ever before known. Conewango pineries were the wonders of their day, and their fame had extended to other countries. Nature was provident in the streams that were to furnish power for the reduction of this forest, which in time gave place to the now productive farms. In 1810 John Frew built a saw mill on lot 53. At a later date he with his brother James and Thomas Russell built a mill at the mouth of Frew Run on the east side of the Conewango, on lot 61. Thomas Russell sold his interests in 1815. In 1817 the Frew brothers, with their father, Hugh Frew, built a gristmill, using the same power and flume for both mills. The saw mill passed into the hands of Jefferson Frew, who in 1872 put in steam and operated it for a number of years. Matthew Turner is supposed to have built on lot the second mill in town; it was bought by Josiah H. Wheeler in 1816. James Wheeler, his son, built a mill on the same lot farther east, using one power and flume for both mills. On lot 45 Mr. Taylor built a mill; this was later owned by G. W. Fenton: the property passed into the hands of Otis Moore and on to his son, O. H. Moore. The plant was unusual in operating ability, the streams at this point being fed by numerous springs so that sawing could be done almost any day in the year. On the same lot east, Job Toby built a mill between 1816 and 1820. On lot 36 Amasa Littlefield built a mill that was purchased and rebuilt by John Myers. Reuben and John Thayer built a mill on the same lot east, that was purchased by John Townsend in 1841 and operated by himself to the time of his death in 1860, and by his son Samuel to 1888. Cyrus Clough was another saw mill builder on lot 28. This mill was conducted later by Jacob Persell. John Bain, Sherman Jones, John Townsend, Jr., Henry Bennett and Stephen Bennett, successively. By this time John Frew built a third mill on lot 27. His son, James R. Frew, carried on the business in later years; was later a resident of Cleveland, Ohio, and in 1902 was the oldest person living who was born in the town of Carroll. Jediah Budlong as early as 1832 built a mill on lot 19 with an overshot wheel, and had a usual annual product of 500,000 ft. of lumber. In 1848 Emrich Evans. with Budlong, rebuilt the mill, and it passed into the hands of L. L. Rawson, purchased later by John Hiller and burned in 1872. At the head of Frew Run, John Myers put in a mill that Samuel Cowen purchased later. All these mills were on Frew Run, a stream not exceeding live miles in length, and all were operated three or four months in the year. In early times, water was held back by the density of forest, so that even in a dry time, after a thunder shower, quite a stroke of business could be accomplished. Few of these mills sawed one hundred thousand feet of lumber a year — more sawed three or four times that. With two exceptions, all these mills were running up to 1860. Steam superseded the water power on this stream, and one mill is in operation at the present time (1902), that of Lewis Brothers on lot 45. In the southwest portion of the town were five mills on the same stream for a distance not exceeding a mile, the first of which was built in 1833. The mills were built by Daniel Wheeler, Luther Forbush, Joseph Hook, Benjamin Price. The Wheeler mill passed into the hands of H. H. Fenton and son, Hook mill sold to J. Brokaw, and at a later date, Brokaw built farther up the stream. George Wiltsie purchased the Price mill, introduced steam, and operated as late as 1885 with an annual product of 100,000 feet. In 1883 Mr. Wiltsie cut fourteen thousand pine shingles from a single tree. On lot 32, on Case Run, the three Pope brothers, Jediah, Gersham, and Chester, who were known as the old company, built and operated a mill; they afterwards sold to Asa Comstock. These brothers later built two mills on lot 14 The Covey mill was bought by G. W. Fenton, Jr., on lot 23, in 1834. James Cowen between 1838 and 1840 built a mill on the same lot. Mr. Comstock sold his mill to D. Harrington and built another on lot 24, and which was operated later by Holiday & Ames. Another mill owned by Pliny Cass was the lowest on Case Run, and passed into the hands of his son, J. Smith Cass. In 1848 G. W. Fenton Jr. built a mill just below the one he purchased in 1834, and in 1851 still another, using the same power and flume for both. These mills had unusual capacity, the usual annual product being 500,000 feet of lumber. In 1859, the product reached 1,100,000 ft. Both these mills were operated for 20 years, when the lower mill was arranged for shingle sawing. The other mill is still (1902) in operation by the Fenton brothers, who are using the original water power with a turbine wheel. The Harrington mill is also in operation with the original water power. Amasa Burt purchased one of the Pope mills on lot 14. In early times, shingles were rived and shaved from the best pine timber, but as first-class pine diminished, shingle machines were introduced and timber that would not admit splitting and shaving was sawed into shingles. Twenty-five thousand pine shingles cut from a single tree was not an uncommon product in those times. The product of these several mills was hauled to the nearest point on the banks of the Conewango, usually during the winter season, as wagons were unknown in the earlier days. The boards were raited and loaded with shingles ready to float out on the first spring freshet. Vast fleets of lumber were sent yearly down the Conewango to the Allegheny river to Pittsburgh and farther south. For several years the best pine was worth only $2.50 per thousand feet. This was traded for supplies, as flour, pork, tea, coffee, sugar, cotton cloth, etc., flour at times being twenty dollars and pork forty dollars a barrel. A canoe was taken on the raft, and into this were loaded the supplies, then pushed back at the end of a setting pole against a strong current to the starting point. When the first bridge was built across the Allegheny river at Pittsburgh, the contractor came to the Conewango country. He found the timber wanted near the Pennsylvania line. Upon inquiring the price, the owner told him he could have all he wanted for nothing as the ground upon which the timber stood was worth more for agricultural purposes than the timber itself. Thousands of pine logs cut from the timber from this valley measured more than five feet at the stump and made from three to five thousand feet of lumber, while there were occasional logs that measured seven feet across. None of these majestic sentinels now remain. In 1878, A. M. Woodcock cut from lot 45 two trees measuring four and a half feet at the stump that netted him $185. While these did not compare with many of their predecessors in size, their commercial value was considerably greater. The last tract of land of any considerable size with a growth of primeval pine upon it was the Prendergast estate in Kiantone, formerly a part of Carroll. It was purchased in 1887 by William Townsend and Daniel Griswold, who erected a mill and manufactured it into lumber. The estate consisted of more than 800 acres, of which 600 were timbered. Many of them were magnificent trees fit for the mast of a stately ship. There were several millions of lumber cut from this tract.